At first glance Stockholm can seem hard to navigate, as the city sprawls across 14 islands connected by bridges, but if you plan out your days it’s easy to find your way around and make sure you don’t miss anything! The city is compact enough to walk everywhere, but you should take at least one ride on the metro just to see the amazing artwork that decorates the stations. There are a lot of highlights to cover, so follow icelolly.com’s 3-day Stockholm itinerary to catch all the best bits! A weekend in Stockholm has to start in Gamla Stan, Stockholm’s old town which has winding cobbled streets, brightly coloured buildings and shops selling traditional gifts and souvenirs. 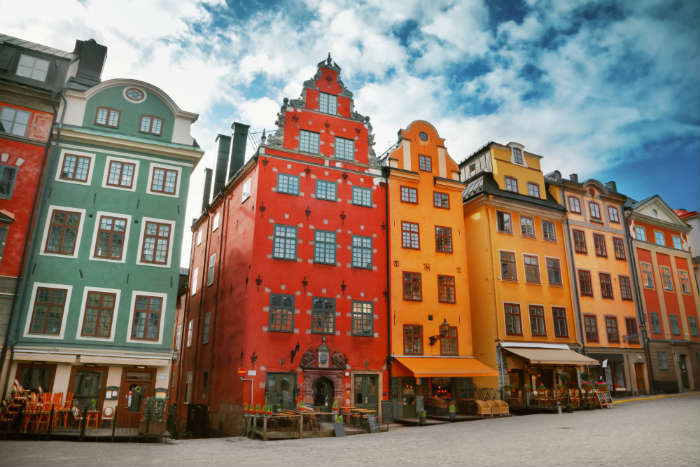 The colours of Gamla Stan make it one of Stockholm’s most popular photo spots – you can count on getting your best Instagram snaps here! The old town has several churches and museums including Stockholm Cathedral, but its main attraction is the Royal Palace, one of the largest palaces in the world. The Royal Apartments and Treasury are open to visitors if you want to take a tour, or you can see the changing of the guards for free – just check the times as it varies between seasons. 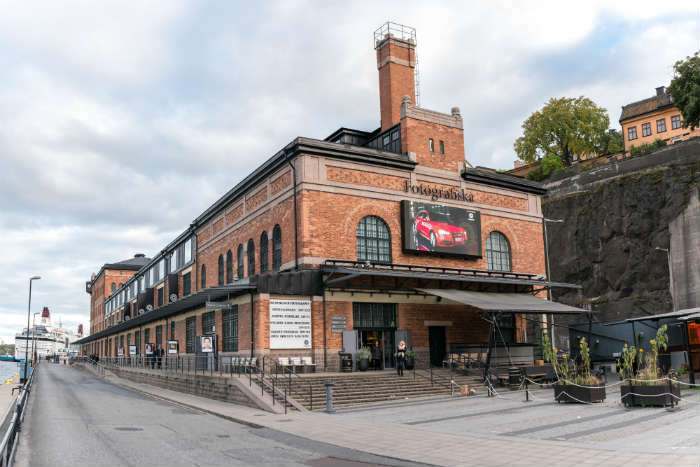 After grabbing a bite to eat, head south from Gamla Stan to Fotografiska, one of the highlights of Stockholm. 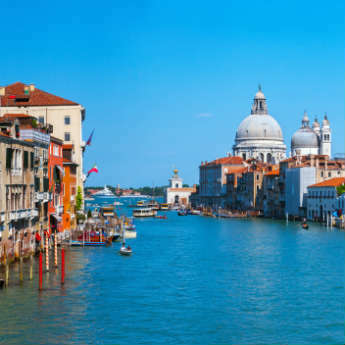 This famous gallery of contemporary photography is a haven for art lovers, with exhibitions by world-renowned photographers and up-and-coming talents changing regularly each year. The building itself is also deserving of a mention – it’s been renovated beautifully and the café on the top floor offers unbeatable views across the river. 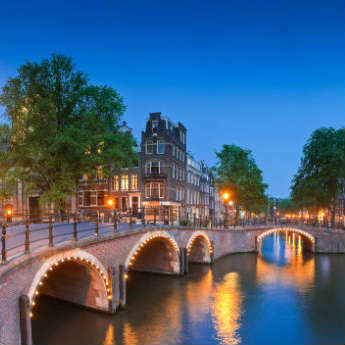 Start your day with the Royal Canal Tour, which departs from Strömjaken port. This pleasant boat tour takes visitors along the Djurgården Canal, leaving the inner city and circling around the green open spaces of Djurgården island. It’s a great introduction for newcomers to the city, and provides views that you can’t see from anywhere else! After the tour, head to Kungsträdgården via the Opera House, which is worth stopping at to snap a picture or two even if you don’t go in. Kungsträdgården (King’s Garden) is a spacious garden with a large paved fountain area and cherry blossoms through spring and summer. It’s a pleasant space to stop for a drink or bite to eat, so pick up a snack to eat by the fountain or take a seat at one of the outdoor cafes. After lunch, pop down to Parliament House on the edge of Gamla Stan – the Swedish parliament building is made up of 2 buildings that sit on their own little island. The parliament is open to the public if you want to take a guided tour or attend a public hearing. From here you can drop by City Hall, one of Stockholm’s most recognisable buildings and venue of the Nobel Prize banquet. You can tour the Hall, or climb the Tower to enjoy amazing views of Stockholm. 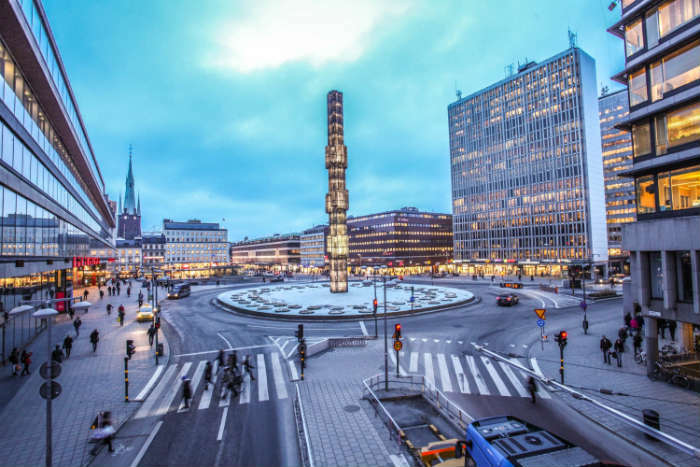 The final stop is Sergels Torg, Stockholm’s central square whose modern style lies in stark contrast to the old town. In the middle of the square is the Kristallvertikalaccent, a tall glass column that lights up at night. It’s a popular shopping district, so spend your afternoon browsing the malls and having a drink with a difference at Stockholm’s Ice Bar! Your last day can be spent exploring the sights and attractions of Djurgården. 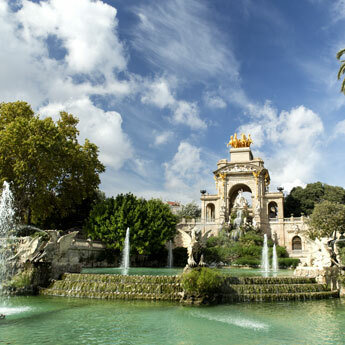 You’ll most likely access the island via Djurgården Bridge, an ornate iron bridge with sculptures of old Norse gods. 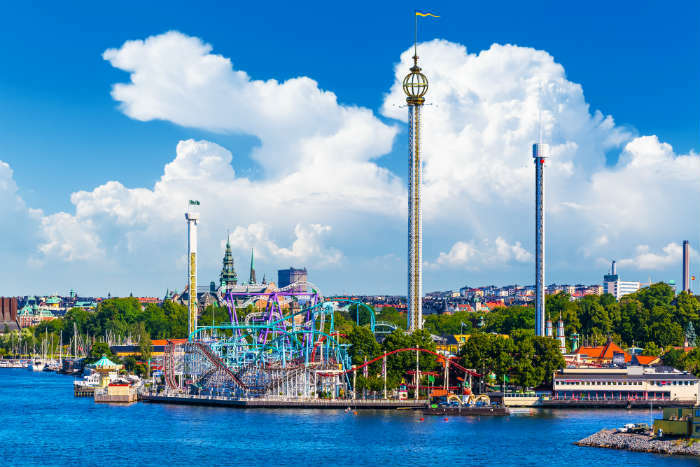 Djurgården is dominated by parkland and outdoor attractions – you can visit Skansen, the open-air museum and zoo that explores traditional Swedish life through recreations of villages and showcases Stockholm’s wildlife, go to the fairground, or just go for a leisurely walk around the island. With Stockholm being an expensive city to eat out in, buying food from a supermarket and having a picnic in the park is a great budget lunch option. If you need some indoor activities, Djurgården has several museums to explore. Vasa Museum is one of the city’s most popular attractions, a Viking maritime museum whose highlight is the perfectly restored warship that sank in the 1600s and was recovered from the bottom of the sea. Pop music fans will not want to miss the Abba Museum, which displays the band’s outfits, interviews, concert footage clothes and other memorabilia in an interactive experience. 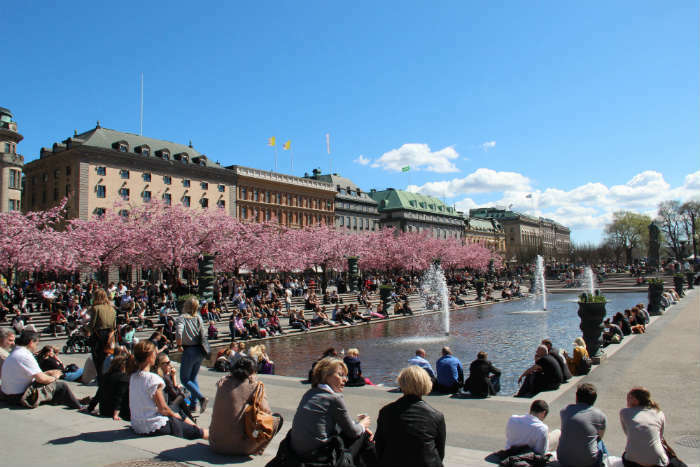 A perfect way to end your city break in Sweden! Are you going to Stockholm? What are you most looking forward to?